Before we get started, I would just like to offer full disclosure, I wrote this review myself, as I always do. 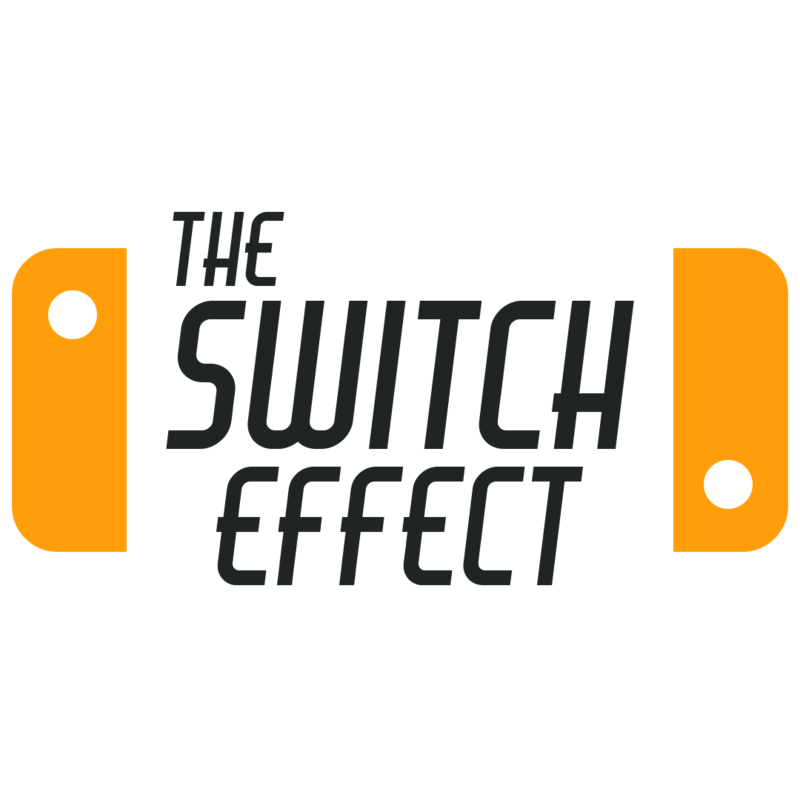 We here at The Switch Effect pride ourselves upon our professional integrity and take plagiarism incredibly seriously. I often question the logic of any developer who releases a Kart racer on a Nintendo console. 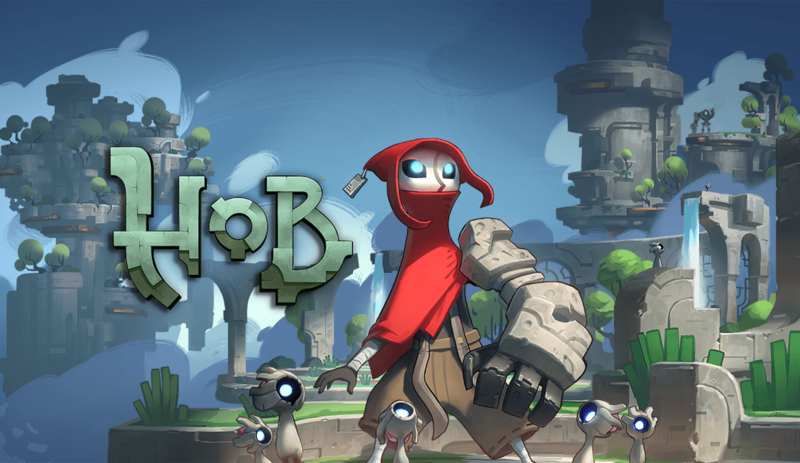 The problem is, the developer could submit a really solid game, and for better or worse, comparisons will be made to a certain Nintendo Franchise. Obviously I’m talking about Mario Kart. Case in point, back in the dreary days of the Wii U, when people only ever ate potatoes due to the depravity of the time we lived in, there was a rather spectacular game called Sonic All Star Racing. I played that game with anybody who would show any interest, pumping hours of my time into what was an absolutely solid racer. It also used the Game pad really well. You could have 1 player on the TV, one on the Pad. Witchcraft I tells ya! Suffice to say, I absolutely adored it. Soon after, Mario Kart 8 dropped and I never looked back. 265 hours of play time on my Wii U, 60 hours on my Switch. Thanks for the memories Sonic. Herein lies the problem. Nothing will ever compare for 2 reasons. 1. As much as I love fruit, I love Mario more. 2. Nintendo made it. Therefore it’s an incredibly well made game, bug tested so much, it borders on extermination. The story in this fruity little number is non existent, as it should be. There is a solo campaign mode but it simply consists of winning races, having fun and unlocking new tracks. Again, as it should be. 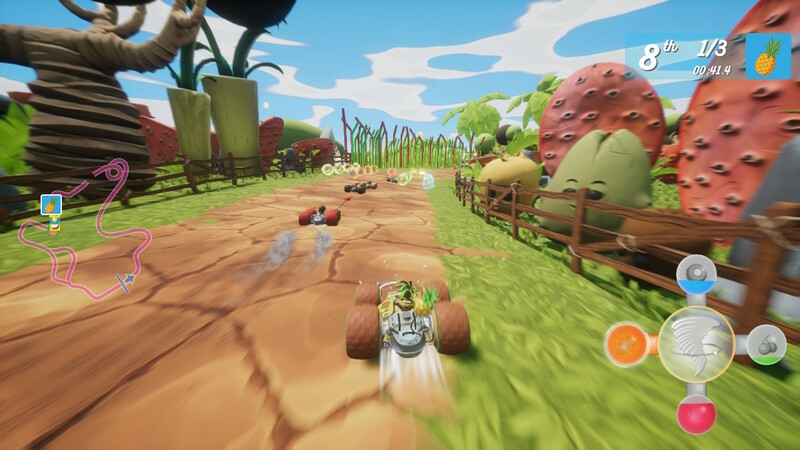 All-Star Fruit Racing isn’t inherently terrible. 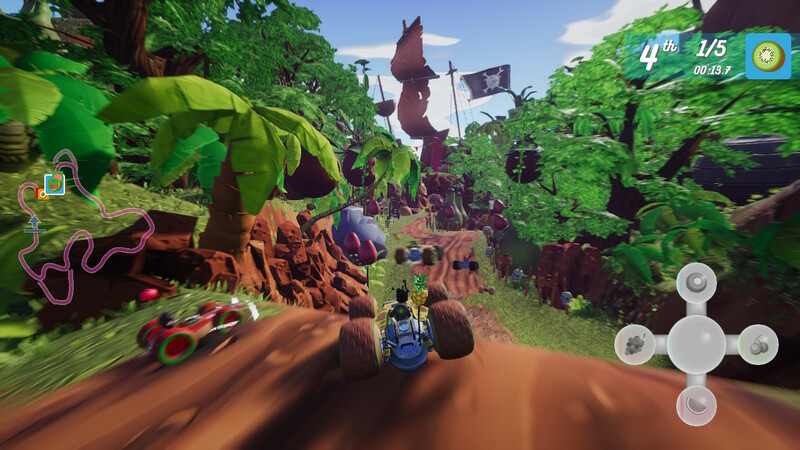 It’s imaginative, the course design is colourful and vibrant and the soundtrack could have been composed by Grant Kirkhope’s understudy. 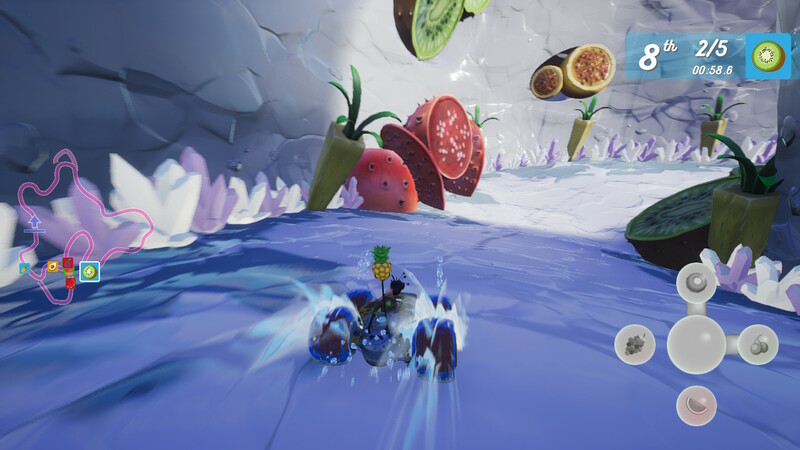 The power ups also offer a good variety and the fruit charge meter is unique and intuitive. Furthermore the drift feature having an overheat mechanic is a nice touch. Essentially it means you can’t spam the drift boosts and win everything. Which is absolutely fine. In fact, one of the things that I really like about this game is the difficulty and the learning curve. My absolute favourite part of All-Star Fruit Racing was the load screens. Again, this isn’t a dig at the inferior quality of this title, quite the opposite in fact. 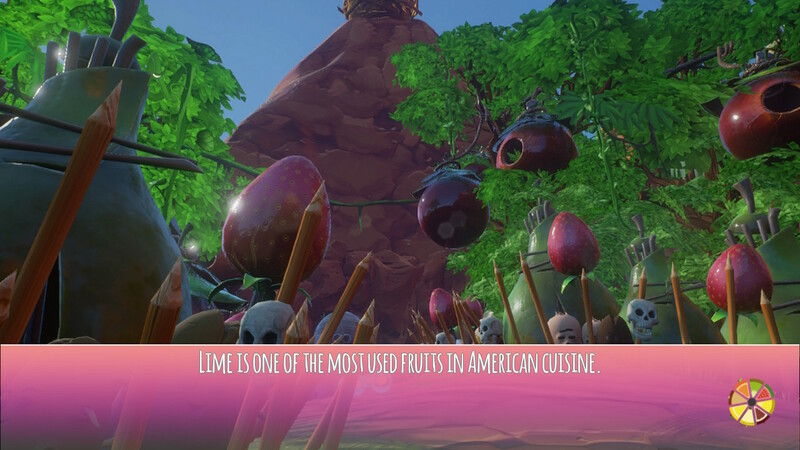 You see, when the game is loading, you are given all kinds of interesting titbits about fruit. I wouldn’t possibly want to spoil any of these for potential audiences but let me just say, there are some crackers. They say knowledge is power. Well I certainly levelled up playing this game. At the same time, people who don’t find useless knowledge about fruit might simply grow weary of the often extended wait times. 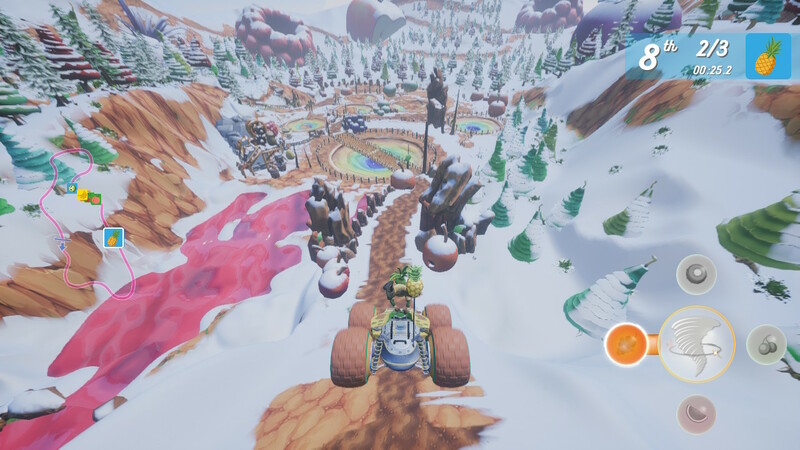 Saying this, its very simple to pick up and play and despite the aforementioned hundreds of hours playing that kart racer, everything did fall into place, once I seemingly worked my way around the balancing issues. It’s not all peaches and strawberries though. There were a few moments that genuinely frustrated. At one point as I navigated to take a corner sharply and hopefully give myself a competitive edge, I seemingly hit an invisible wall and simply got stuck. I also found the hit boxes when using power ups to be over generous to say the least. 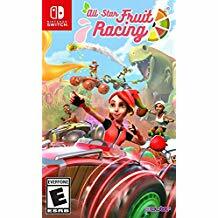 Saying that, game play on the whole was enjoyable and with the selection of racers, all with their own individual fruit, alongside the plethora of tracks and aforementioned power ups. There is a fair amount of bang for your proverbial buck. It’s fair to say that it will never be able to compete with its AAA moustached maverick of a 2nd cousin – twice removed. Despite this it’s still a decent offering that has enough of it’s own unique attributes to stand out. 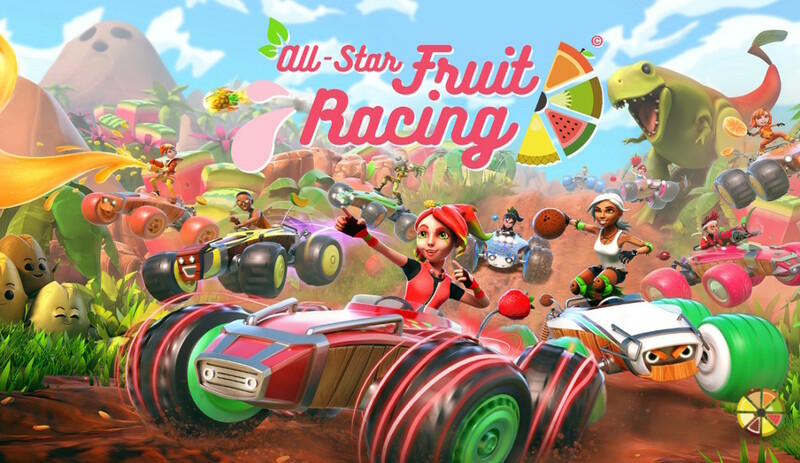 All-Star Fruit Racing is best enjoyed by the fruit of its own labour. It’s entirely possible that the targeted audience here is more likely younger kids and casual gamers, people who don’t have a lifetime affinity with Wario or Yoshi. 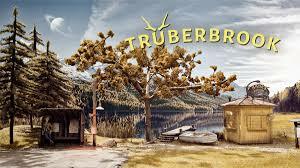 By that token, it succeeds in offering some good, vibrant fun but in all honesty, with the premium price point, you might be advised to supplement the difference and go Nintendo. Solid kart racing experience, albeit unrefined. Decent soundtrack, average textures. Colourful and fun, although at times frustrating. Solid weapons system.